Vicky Armstrong is an Advanced Registered Nurse Practitioner (ANP) with over 13 years’ experience as a Family Nurse Practitioner. 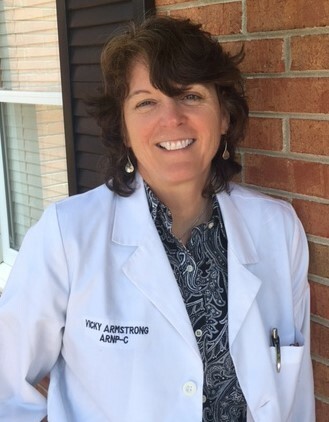 After completing her ANP from the University of South Alabama, she obtained Nurse Practitioner certification through American Academy of Nurse Practitioners (now American Association of Nurse Practitioners) in 2004. Vicky developed her personal interest in Integrative Medicine when she researched and successfully treated her aging dogs with non-pharmaceutical remedies. She continues her pursuit of cutting edge knowledge and is currently a member of the Institute for Functional Medicine (IFM), working towards certification. IFM’s philosophy includes determining root cause of symptoms while promoting health and wellness from the patient’s immune system and other natural sources. Vicky joins Atlanta Integrative and Internal Medicine with a wealth of clinical experience. Her previous practice experience includes Cardiology (5+ years), Family Practice/Internal Medicine/Emergency Room (3+ years) and Hospital Medicine (4+ years). She is equipped to help our patients with everything from acute to chronic illness. Her current interests are in balancing adrenal fatigue and thyroid function as well as bioidentical hormone replacement therapies for both men and women. Vicky’s passion is to empower her patients with knowledge and information so they can achieve optimal health and well-being. When not studying or working, Vicky enjoys the out of doors; bicycling, hiking, and running.